Carson’s Brewery, founded in 2012 in Evansville is Southern Indiana’s premier microbrewery. We started with barrel batch sizes used to test, improve and perfect many different types of beer. A few had what it took to make the cut and became the staples of our core offerings. These and our seasonals are available to you both in package and in your favorite bar or restaurant. 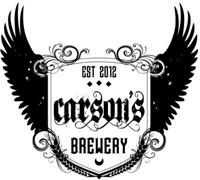 Carson’s Brewery will be offering a variety of American ales, wheats, brown ales, IPAs and multiple seasonals. Stop on by and try them or one of our other crazy one off brews that will be in limited release only at our tasting room. While you are there fill up a growler or take a tour. After all we are always proud to show off what we’ve worked so hard to create for you! Cheers.